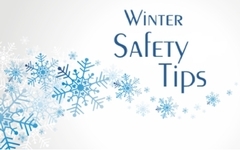 With winter knocking at our door, it is time to be prepared and safe. Here are some tips to help. Avoid boots or shoes with smooth soles and heels, such as plastic and leather soles. Instead, wear shoes or boots that provide traction on snow and ice; boots made of non-slip rubber or neoprene with grooved soles are best. Approach with caution and assume that all wet, dark areas on pavements are slippery and icy. Dew or water vapor can freeze on cold surfaces, forming an extra-thin, nearly invisible layer of ice that can look like a wet spot on the pavement. Walk in designated walkways as much as possible. Taking shortcuts over snow piles and other frozen areas can be hazardous. Look ahead when you walk; a snow- or ice-avoid texting, covered sidewalk or driveway, especially if on a hill, may require travel along its grassy edge for traction. Bend slightly and walk flat-footed with your center of gravity directly over the feet as much as possible. Beware if you are carrying a heavy backpack or other load—your sense of balance will be off. If you must carry a load, try not to carry too much; leave your hands and arms free to balance yourself. Keep your hands out of your pockets. Hands out of your pockets while walking lowers your center of gravity and increases balance. You can help break your fall with your hands free if you do start to slip. Watch where you are stepping and GO S-L-O-W-L-Y !! This will help your reaction time to changes in traction. When walking on steps always use the hand railings and plant your feet firmly on each step. Use special care when entering and exiting vehicles; use the vehicle for support. Take short steps or shuffle for stability. It also helps to stop occasionally to break momentum. Ice melt is available at our multi-family properties. Please use it. If the container is empty, please contact the office at (715) 359-1500 to refill it. Make sure windows are closed and lock properly. Tightly close exterior doors, including the main entry in a multi-unit building. No one wants to shovel out the inside of a building because the door blew open. If you choose to use a door mat, please place them inside your apartment. Hallway mats can be a trip hazards and are not allowed. Check those furnace filters. By changing the furnace filter you will cut down on fuel costs, overheating and the shutdown of a furnace. Keep area around the furnace clean and clutter free. If you have a garage, use it. Unless agreed on previously, garages are used for storing your vehicle and we do want you to do so. If the landlord tends to the snow removal, please be proactive and put your vehicle in the garage when a winter storm is approaching. This will help with plowing and snow removal. If you put up holiday lights, please remove them when the holiday is over. Do not leave holiday lights on when you are not home. If you have a live tree during the holidays, be sure to keep it watered and dispose of it properly and immediately after the holiday is over. Check indoor holiday lights and/or pre-lit trees carefully for safety and do not leave on when you leave. Dispose of any possible hazardous lights. Please have a safe and warm winter season.